Hello to all my ribbon-loving friends, and welcome by my blog! I hope you're having a wonderful week. Here in Las Vegas, it's been SO nice and warm (in the high 60's to low 70's). It hardly even seems like Winter, and I'm loving it. Today I'm sharing this super sweet Valentine with you that I made using some lovely seam binding and goodies from Really Reasonable Ribbon. They have everything you need to create something extra special for your special Valentine. Isn't this sweet? This card started with an ivory base and some romantic patterned papers. I used one as a base, and the other two to die-cut and hand-stitch layered hearts with dusty pink DMC floss. I also added some tulle netting over the smaller heart to hold in some white sequins. I attached the hearts together using Scor-Tape which is an amazing long-lasting Adhesive available in several different widths. I use it quite a bit cuz it ROCKS! I ran a width of GORGEOUS Bay Leaf Seam Binding across my card and also tied a bow with it. I also added a bow tied with Cotton Candy Baker's Twine, and used that to attach a small inked hang tag with my stamped sentiment (Love) from a rusty pear-shaped safety pin. I tucked some White Double Head Stamens, Baby Pink Double Head Stamens, and Aqua Green Double Head Stamens behind the bow cluster, and bundled some Ivory Burlap String underneath everything. Be sure to stop by the Really Reasonable Ribbon Blog each day to find inspiration, learn about special promotions, and take part in our monthly Blog Hops. There's always something exciting to be found there, and LOTS of great products for you to enjoy in the Really Reasonable Ribbon Shop. Thanks so much for stopping by my blog today, friends. I always appreciate your visits and your kind comments, but especially so now while I'm feeling crummy. Papertrey Ink - Make It Monday #311 - Using Different Patterned Papers - I used Heather's fabulous tutorial on mixing patterned papers to create my card. 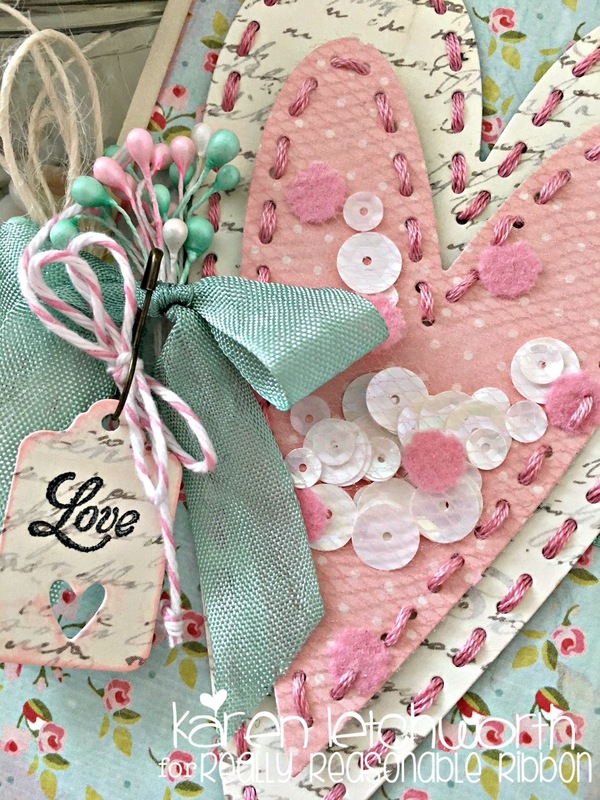 The PTI products used include the Stitched Primitive Hearts die-cut set. I just ADORE this set. 4 Crafty Chicks - 1 Word (Love), 2 Patterned Papers, 3 Hearts (can you find my third heart?? It's hiding. Hint: Look at my hanging tag). Fun challenge! So sorry to hear you're feeling crummy. I'm praying you'll recover nicely and sooner than expected. Wow! What an absolutely gorgeous card, Karen! Everything about it from the colors, to the patterns, to the textures is simply perfect. Have a great day! Wow, it's just adorable!! Fabulous! Beautifully sweet card, Karen! I hope your recovery goes well. Just love your netting over the sequins! Very pretty, Karen! Love the hearts. Absolutely beautiful! I love all of the details & elements!! Thanks for playing along with 4 Crafty Chicks Challenge, hope to see you again! Very pretty card - really like the colors! Hi Karen, read all the way to the end of your post only to find out you're not feeling well. so sorry to hear, and praying it's short and you're back in great health soon. Meanwhile, what a gorgeous card. The ribbon and other elements are lovely. and I adore the layers, all of them! 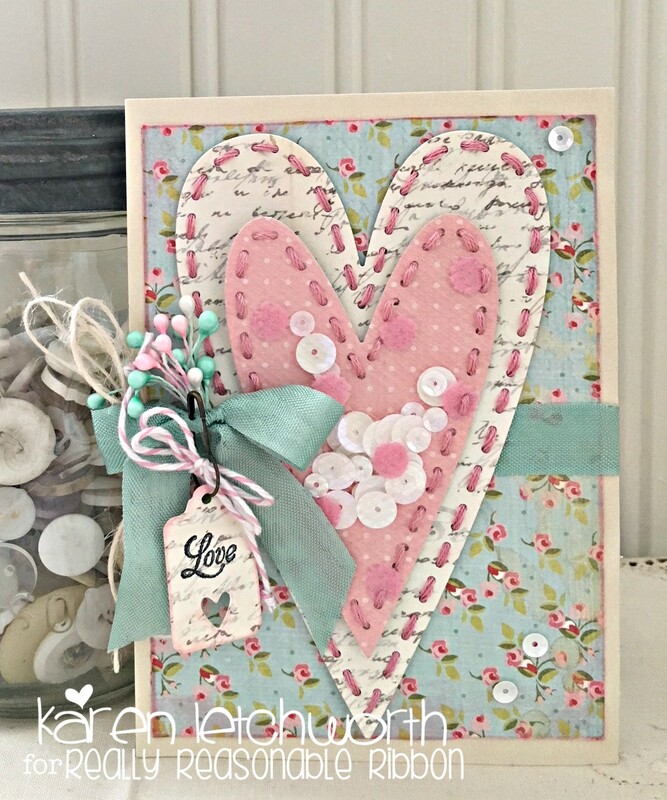 Karen, your card is so lovely; all the pretty ideas wrapped into one card...I wish I could think like you do!! The added layer of tulle to nestle in all the sparkly sequins is so sweet. I do hope you're feeling better. Blessings on your day! This is such a beautiful card. 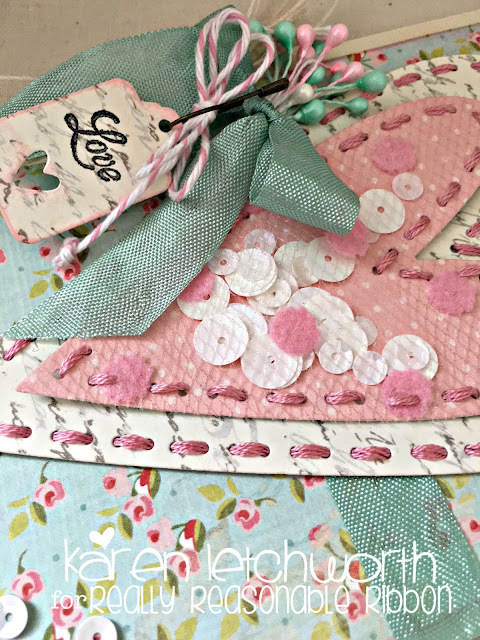 The palette reminds me of the Cath Kidston and I LOVE the buttons, stitching and that label with LOVE!! 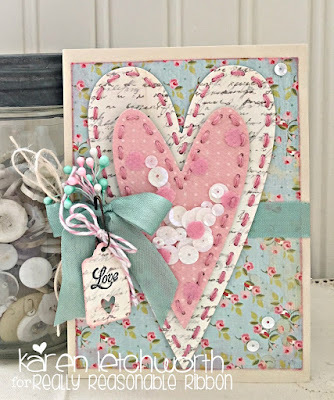 Thanks for joining us for the "All you need is LOVE" challenge over at Frilly and Funkie, I'm sure glad you did! love the stitching and how you grouped the sequins. very pretty. Beautifully created Karen, in fact you have some very nice creations on your blog, as always, very pretty!! So pretty, love the details, could you link this to our blog please. Very nicely done, thanks for playing at 4 Crafty Chicks.